IGame Casino will then reward you with a bonus (Welcome Bonus is for new players only). The terms and conditions of the bonuses vary between different casinos and might also change over time and between different countries, so it is important to compare the different offers and read the T&C for IGame Casino before signing up. Owned by iGame Malta Ltd Casinos and licensed under the regulations of Malta Gaming Authority, iGame Casino was made public back in 2008, making its decade-long online gambling journey worthwhile. This online gambling venue is additionally mobile-friendly, so if you are busy person who is often on the go, you will not be deprived of the supreme gambling experience found at iGame Casino. 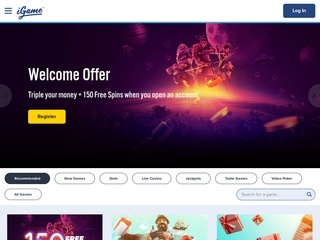 Available in English, Swedish, Finnish and Norwegian, iGame Casino offers a feel of acceptance for international players, despite the country restrictions set on this casino. Namely, plates from the UK, the US, Ireland, Australia, Canada and about 20 other countries cannot play at iGame Casino. The benefit of this online casino is seen in its complete encryption and protection of all clients’ personal information shared upon registration. This online gambling venue has repeatedly proven how reliable and trustworthy it is, so rest assured and play your game. When an online casino host games provided by Microgaming and NetEnt, we know it is home to fairness and randomness – iGame Casino is regularly audited by TST and eCogra. Encompassing an ample selection of online games suppliers, iGame Casino ensured total diversity and never-ending entertainment. Covering its portfolio with all of the titles manufactured by Microgaming, NetEnt, Thunderkick, Relax Gaming, Gameplay Interactive etc. iGame Casino has it all! The complete repertoire consists of all sorts of games that will appeal to all sorts of players. Everything from slots, jackpots, table and live games to video pokers is at hand – all you need to do is enjoy! At iGame Casino you will come across all of the popular titles, but be ready to be met by some really obscure slots you have never seen before! Each day at iGame Casino brings a new surprise in this manner, so you are continually rewarded for playing here. Te slot assortment is compiled from White Rabbit, Hugo Goal, Piggy Riches, Book of Ra Deluxe, Gonzo’s Quest, Turn It Up! and Platooners, to mention a few. Importantly, the repertoire is updated as soon as the new games are released. Over 50 incredibly immersive table game titles are found in iGame Casino’s orders. All possible variants of Baccarat, Blackjack and Roulette are at hand, so both experienced players and newcomers to online gambling will find something to enjoy. In other games department, iGame Casino is equally as strong. Video pokers like Jacks or Better, Jackpot Poker, All American, Abracadabra, Deuces Wild and Pile Poker are all here for you! 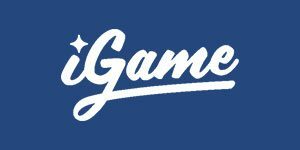 While iGame Casino has the “I” in its name, the Interweb does not hold all of what this casino offers. Its offering expands and evolves to reach the offline gambling as well, joining the authentic traditional gambling with modernised online platforms to bring forward the ultimate gambling experience to your home! The iGame Malta Limited-owned casino offers a wide range of live games such as Live Caribbean Stud, Live Blackjack, Live Roulette and Three Card Poker. Each of the games has its own stakes listed under the thumbnail, so even before you enter the game’s world, you will know what you are playing with. This online casino will not let anything get in the way of your entertainment, so it ensures speedy and efficient banking, which when not done right, can be a real pain in the neck. Regardless if you are depositing or withdrawing you hard-earned money, you can use about 10 different means of transferring cash. Those include bank wire transfer, numerous ewallets, as well as credit and debit cards. What we always like to see is quickness in request-processing, and iGame Casino sure does this effortlessly. The casino prides a 0-24 hour time frame for all methods, with the exception of bank transfers, which might take up to 4 days. Within a 24-hour period, you are allowed to withdraw up to a phenomenal 20,000 in your respective currency! The casino does not list a minimal withdrawal amount. Regarding the currencies accepted at iGame Casino, they are as follows: British pounds sterling, Euros, Swedish kronor and Norwegian kroner. Every reputable online casino cares for its customers and makes sure they are content while gambling there. That is why a quality customer support team is a must if you want to be taken as a serious online casino. IGame Casino does a terrific job handling with all of your issue and difficulties, as well as answering your questions as soon as possible. The efficient team representatives can be reached either via email, or utilising the nifty Live Chat feature accessible directly from the homepage. If you are the emailing type, here is the address you will need for all your enquiries: [email protected] If, however, you are fonder of live support, you can opt for the Live Chat and converse with an agent within their working hours, i.e. from 8 am until midnight, Monday through Saturday.